View our Frequently Asked Questions below. For any questions not addresed in our FAQ, please Contact Us. Yes. This course is approved and meets all required state standards. It has been assigned Course #117. This course is in downloadable pdf file format and includes 32 hours of “Classroom” instruction and 14 hours of “Behind-the-Wheel” instruction. Our course is Texas approved and affordable. Plus, you can work around your busy schedule and complete lessons whenever YOU want. 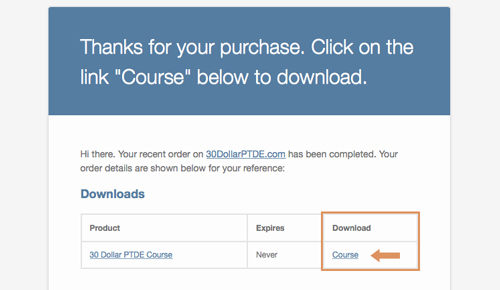 How do I download the Course after purchasing it? *This is a large PDF file and you may have issues downloading it to a mobile or tablet device. Please download and save onto a desktop or laptop computer for best results. Who should I contact if I sent in my fee and request form but haven’t yet received my PTDE Program Guide and receipt? Contact TDLR by email CS.Driver.Education.Safety@tdlr.texas.gov or phone (800) 803-9202. Does this course include online testing for a learner’s license? No. A comprehensive quiz is included in the course for review/study purposes only. When the student is ready, visit your local DPS office for testing. Yes, a student must be 14 years of age prior to beginning the classroom portion; however, they may not test for a learner license until their 15th birthday. Where do I get my (DE-964) Certificate of Course Completion to present to the DPS Licensing Office? The DE-964 is included with the course and will be sent by email 2-3 days after purchase. No. The certificate must be printed from a color printer. In order for the DPS driver license staff to accept, the certificate must be green in color and the control number must appear in the upper right-hand corner. – The “Classroom” thirty-two (32) hours must not be completed in fewer than sixteen calendar days. – The “Behind-the- Wheel” fourteen (14) hours plus the additional 30 hours of driving practice must not be completed in fewer than forty-four calendar days. My teenage son has been driving for quite some time. Can that time count towards the behind-the- wheel time requirements of this course? No behind-the- wheel instruction or practice may be permitted until the student has been issued a learner license. Driving without a valid license on a public street or highway is a violation of state law. ONLY if the entire 32 hours of classroom instruction is completed successfully. Please note that a transfer to a “Commercial Driving School” will require additional course fees be paid to the “Commercial Driving School” that are not included in the purchase of this PTDE course. If my teenager completes the classroom hours of instruction at a commercial (or public) school, what must I do to teach just the behind-the- wheel phase? Contact the school to transfer the classroom hours to you, the instructor of the parent-taught course. Then, you only need the behind-the- wheel phase or Module 13 of course. Be sure to take to DPS the transfer documentation from the driving school showing successful completion of the classroom phase. My teenager completed the 32 classroom hours of instruction in the parent-taught course and I want those hours transferred to a commercial driving school for the behind- the-wheel phase. What should I do? The parent/instructor provides the receiving commercial school with a copy of the completed Classroom Instruction Log and a transfer DE-964. Contact Customer Service at accounts@pttde.com with questions. Yes. The student must be provided with an additional 30 hours of behind-the- wheel practice, which must include at least 10 hours driving at night. These hours are required to be certified by a parent or guardian before a teenager may progress to Phase 2 of the Texas Graduated Driver Licensing Program (http://dps.texas.gov/DriverLicense/gdl.htm). Review the FAQ’s for important timelines. From your teenager’s public, charter, home, private school; GED Program; or Institution of Higher Education Administration Office. What items must be provided to the driver license office for a Learner License or a Provisional License? Consult with your insurance carrier. If I need a form that I don't have where can I go to find it? You can visit https://www.tdlr.texas.gov/driver/drivereduforms.htm to find any forms you might be missing. The only forms you will receive from us are the DE-964 Certificate of Completion and the Behind the Wheel and Classroom Instruction logs.